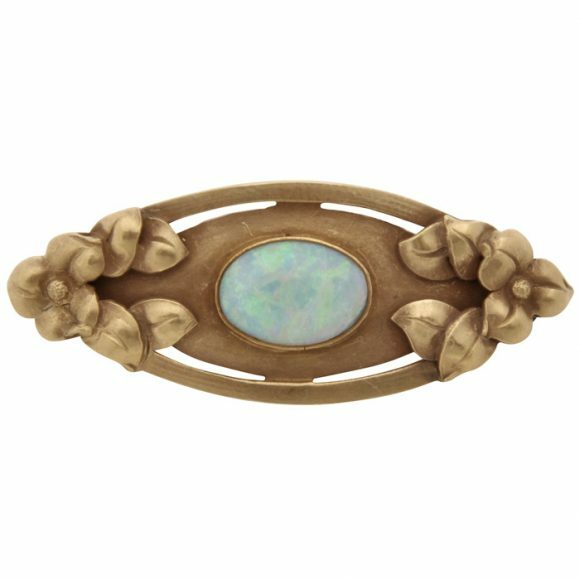 Founded in Chicago in 1900 by Clara P. Barck and five fellow female graduates of Louis J. Millet’s decorative design course at the Art Institute, the Kalo Shop rose to be the most important American Arts and Crafts silversmith studio in the United States. The shop was founded on Millet’s teachings and they adopted the motto “beautiful, useful, and enduring” for their wares. The shop originally created burnt wood, leatherwork, and other decorative arts along with jewelry. Many items from the earliest period are quite scarce and, to date, no one has discovered a surviving example of one of their early successes: an Arabian-cutout-decorated shopping bag in brown and yellow leather. Barck married George Welles in 1905. 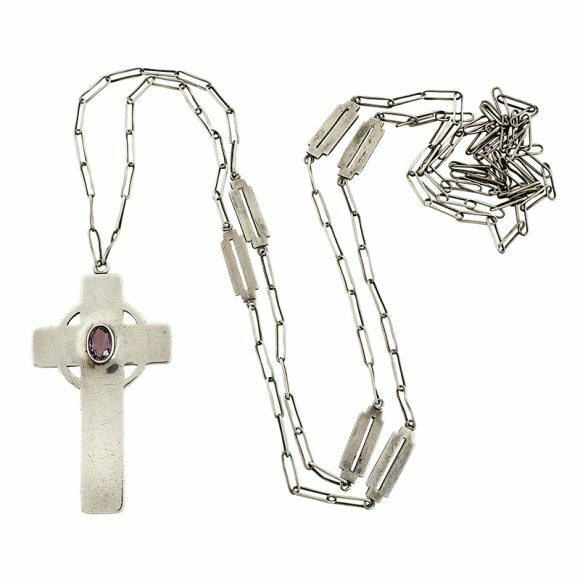 Welles was a coal merchant and an amateur silversmith. 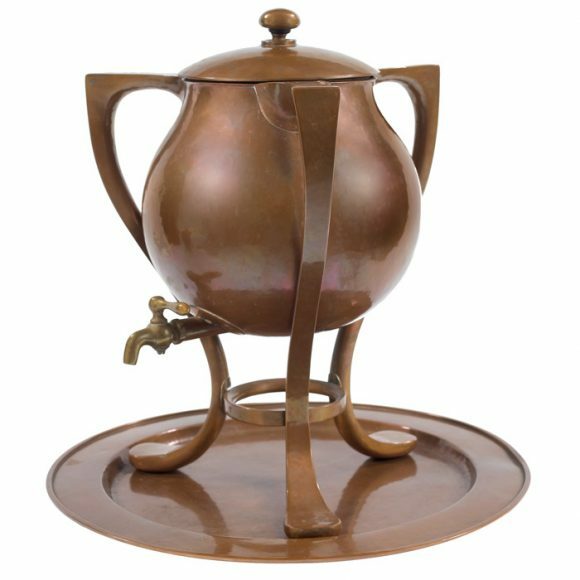 It was Welles who encouraged Barck to focus more on objects made of copper and silver. 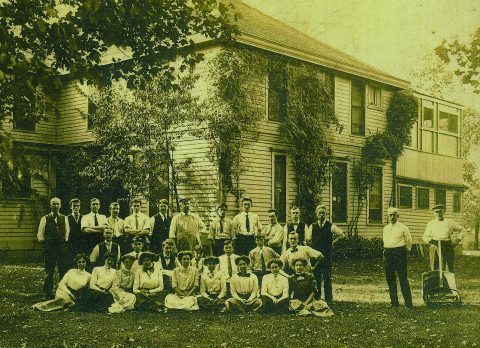 In 1906, Barck’s sister purchased a large home in Park Ridge, Illinois and soon transferred ownership to the Kalo Shop in return for stock in the company. This location served as a hub for the Kalo Arts and Crafts Community. 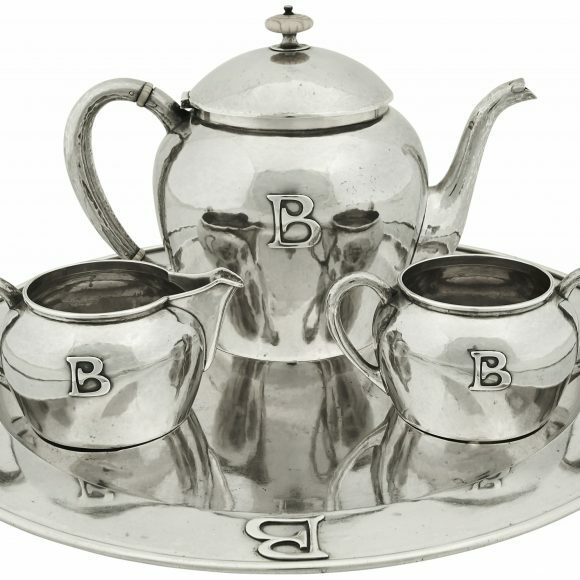 In 1907, Barck employed her first professional silversmith. By 1908, she established a school and would go on to teach and employ many female designers and artisans, known as the “Kalo Girls,” along with various male silversmiths. This collaboration of female designers and male smiths proved quite successful. In 1912, Barck opened a Kalo branch in New York that lasted until 1916, just before the First World War. The shop employed many notable silversmiths that went on to open their own studios and Barck encouraged their entrepreneurship, but they were required to mark all pieces produced during regular business hours with the Kalo stamp. When employees were off the clock, they were free to use the shop to make their own pieces (as long as they did not mark them with the Kalo stamp). Many copper, silver, and gold pieces still exist that were undoubtedly made by a Kalo silversmith but are unmarked. These were likely made for family members, friends, or coworkers. Some of the noted Kalo silversmiths include: Grant Wood (painter of American Gothic, now in the permanent collection of the Art Institute of Chicago), Matthias Hank, Julius Olaf Randahl, Henri A. Eicher, C.H. Didrich, David and Walter Mulholland, B.B. Andersen, Edward Breese, Yngve Olsson, Kristoffer Haga, Robert R. Bower, and many others. Barck retired in 1939 and moved to San Diego. She gifted the Kalo Shop in 1959 to the four remaining workers: Robert R. Bower, Arne Myhre, Yngve Olsson, and Daniel Pedersen. Over time, there were few new silversmiths entering the trade and the decision was made to close the shop in 1970 after Olsson passed away. 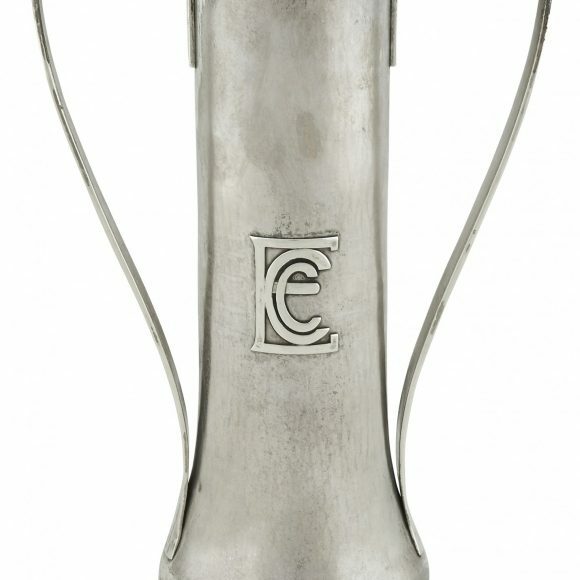 There were not enough staff members to continue making silver in accordance with the high standards of the founding motto. 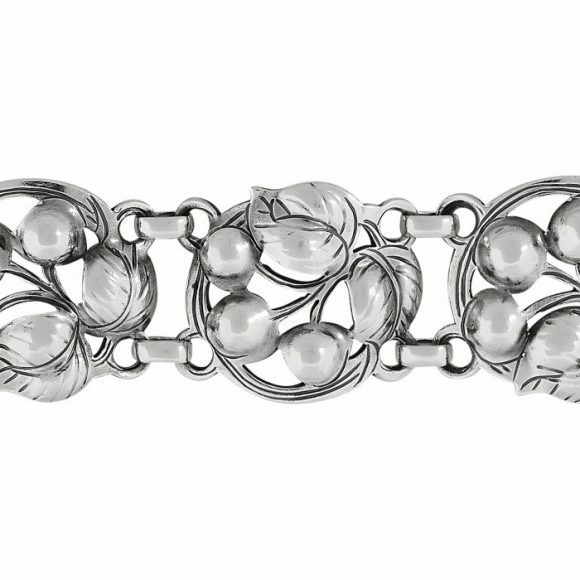 Kalo is particularly known for its “puffy” jewelry lines. These objects are quite organic in composition, designed to reveal fruits of various trees, flowers, and leaves. The most popular items during Kalo’s tenure were the cherry-motif bracelet, necklace, brooch, clip, and ear-clip earring sets. Other artisan designed or one-off examples with semi-precious stones or pearls may be found on rare occasion. With hollowware, Kalo was well known for naturalistic lobes executed on bowls, trays, and other pieces. 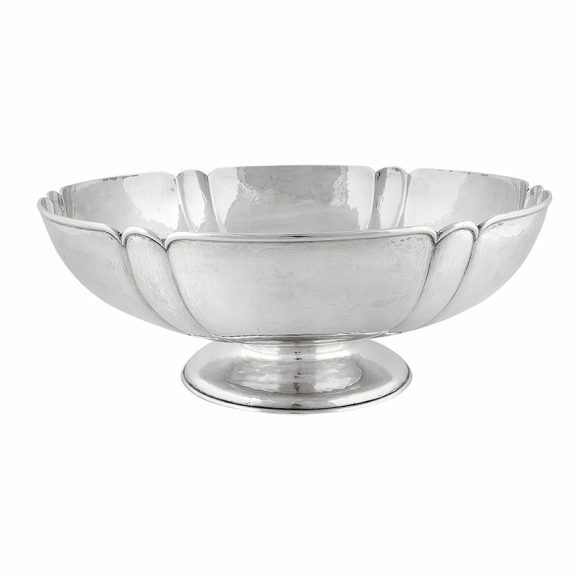 The model “18” bowl is a classic and was offered in three sizes. All of the designs produced throughout the shop’s span are virtually timeless. The jewelry, hollowware, flatware, and other decorative objects are highly sought after to this day. The earliest work stamped with a Park Ridge mark, made from 1905 to 1911, has the highest demand, while works from the Chicago and New York period (1912-1916) are nearly as popular. All work is coveted by collectors regardless of when the pieces were made and many collectors purchase items from every period to show the timeline of the shop and its range of creations. 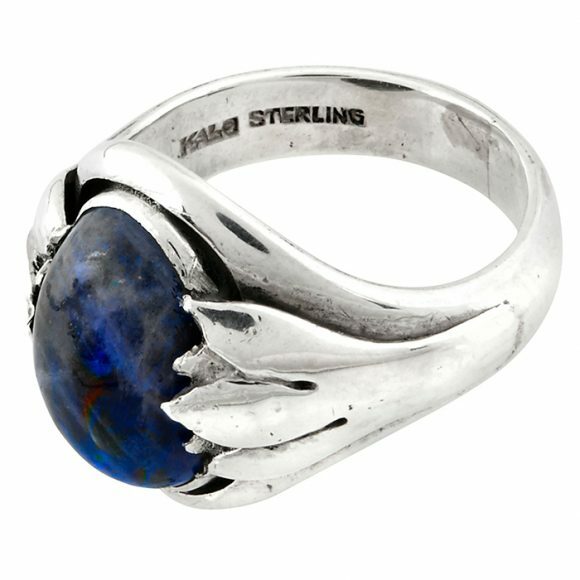 The shop was prolific and objects continue to surface all over, but the rarest of pieces will always demand a premium. Objects with stones, repoussé work, or added decoration tend to be exquisite and embody the epitome of the ideals of the Arts and Crafts movement.